The Towers ancestors have come back to life, gathering together for a flash-mob style dance show on Towers Street. Up until recently, Scarefest lacked a really impactful start of the day. The park experimented with putting an actor on the monorail exit ramp and a smattering of performers near the front lawns, but it didn't quite hit the mark. 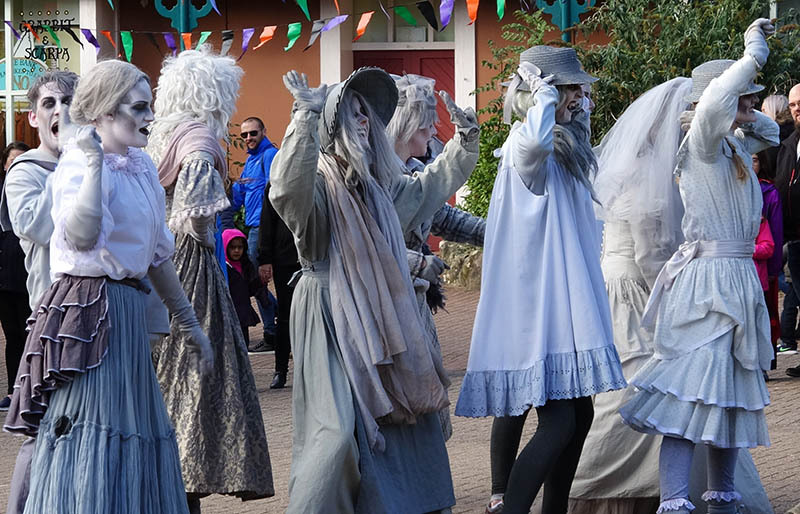 In 2014 they introduced the Alton Ancestors, a flash mob dance party that takes place at the top of Towers Street just as guests are entering the park, and then repeated later during the morning. It is a fun way to start the day, with the eclectic group of characters and statues come to life dancing to some classic Halloween music tracks. Prepare to get involved too - the ancestors have been known to grab people from the audience to join in with the dancing! After the morning's antics are complete, the Ancestors can often be found later in the day down by Duel in Gloomy Wood. Would you marry an ancestor?